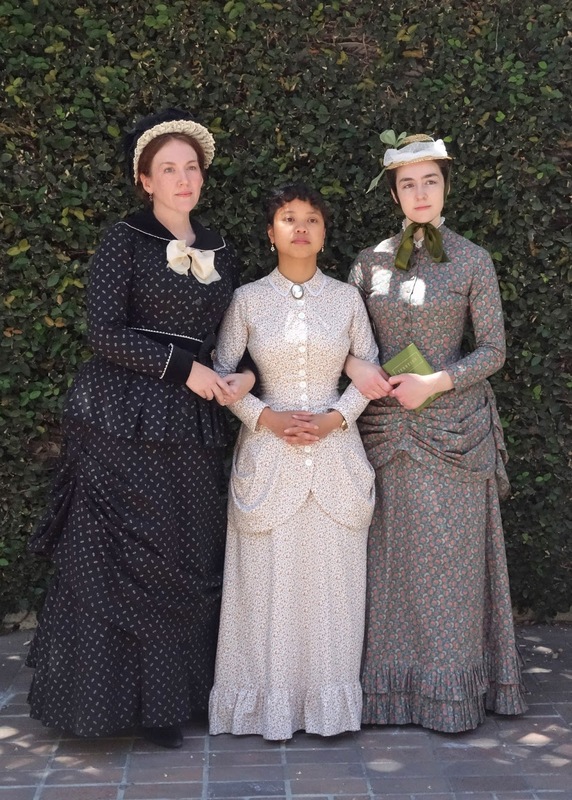 So back in January, I shared a new natural form dress that I had made for a Little House on the Prairie group that was in the works for Costume College. But then I had a change of heart and decided that I wanted a lighter weight cotton dress instead of a heavy wool one. I also am a hopeless follower, and when I heard that my friends were making calico prairie dresses, I decided that I needed one too! 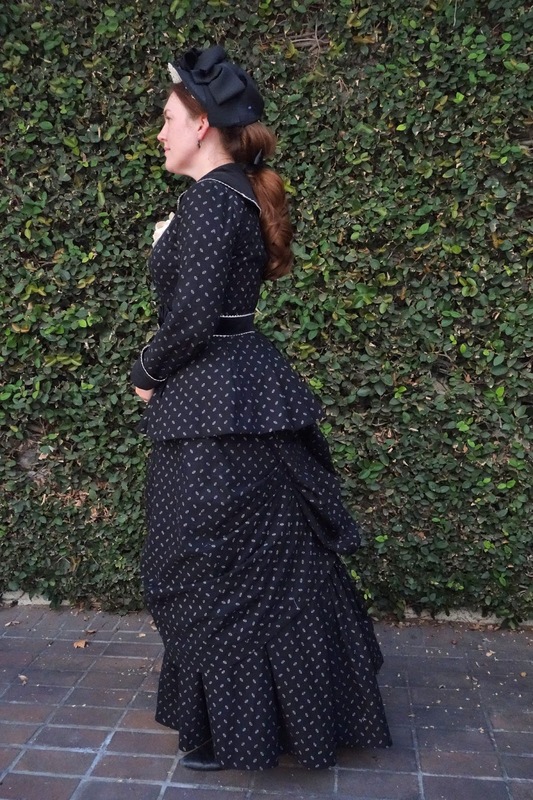 I found a great deal on a repro calico fabric from Saunders Fabrics, and I picked a black fabric with a simple diamond pattern, which I thought it would make a lovely half-mourning dress. I'm so glad that I ended up switching plans because I think we made such a fun little group of Ingalls sisters in our nicely coordinating calicos. For something a little different, I decided to try a yoked bodice, which was an incredibly popular style in the late 1870's. 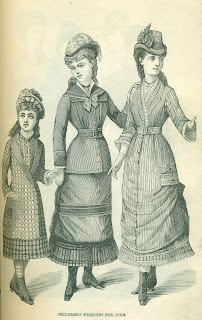 In April of 1879, Peterson's Magazine features a plaid yoked house dress and stated that "the deep waist is made plaited back and front into a yoke; a belt around the waist, with a bow of ribbon on one side." Most of these yoked bodices had high, round necklines or small standing collars, but I found one example of a yoked bodice with a middy collar on a teenaged girl, so I thought that the V-neck might help keep me cool while I also try a style that I haven't done before. To help me get started with the construction, I found 2 yoked bodice patterns and several narrow overskirt diagrams in Fashions of the Gilded Age, Volume 1: Undergarments, Bodices, Skirts, Overskirts, Polonaises, and Day Dresses 1877-1882 . Although I changed these patterns up quite a bit to make my own dress, they were a huge help as I figured out the overall shapes. I used cotton velveteen for the collar, cuffs, and belt, and I edged it with natural linen rickrack, which really made these features stand out nicely. The buttons are vintage and slightly mismatched, which is a fun little detail that seemed appropriate for a prairie dress. 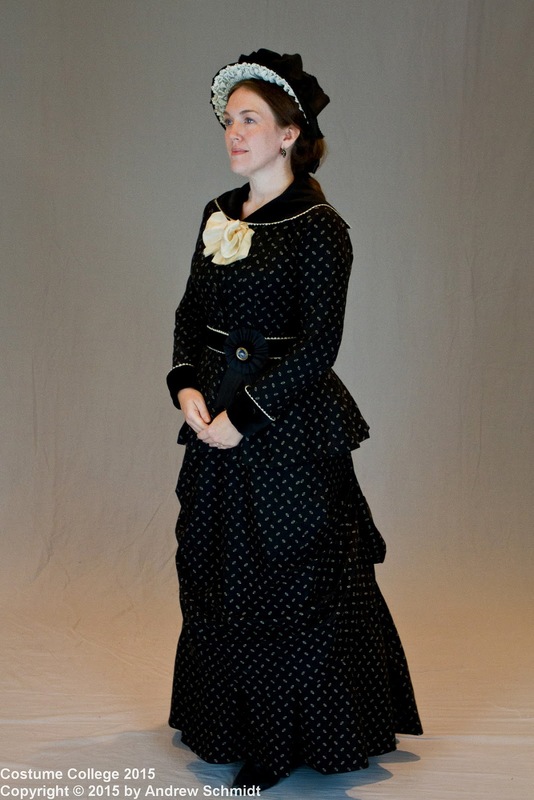 I'm always amused when I see Victorian photos of women who have a mismatched button on their dress. It happens more often than you would think, and I love imagining a practical frontier woman just replacing a missing button with something "close enough" and not wasting any time worrying about it. 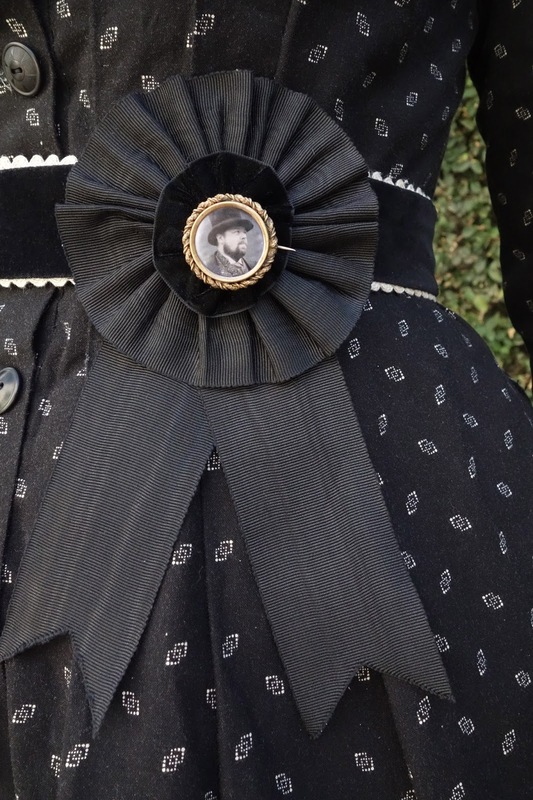 I also wore a silk bow at my neck, and a mourning rosette at my waist. The rosette was a lovely gift from 2 friends, and I made a faux tintype of my husband to use for the portrait. 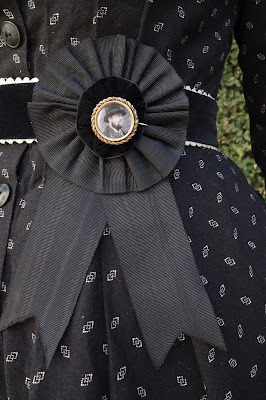 Similar mourning badges were quite popular after the death of Abraham Lincoln, and you can see a similar style here. 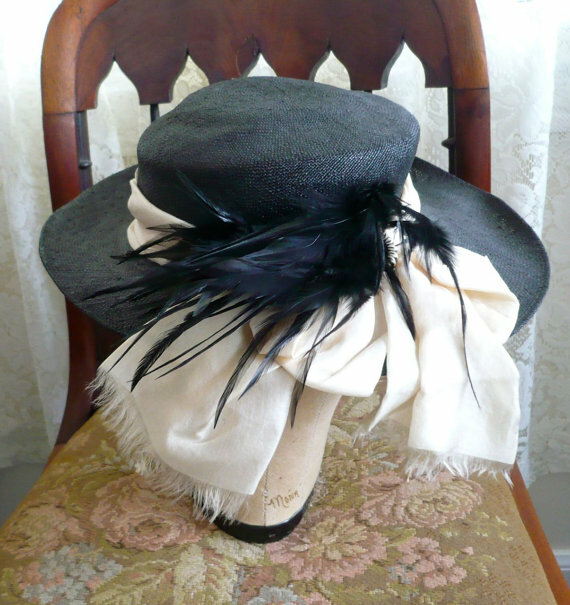 As the finishing touch, I restyled a vintage black straw hat into a bonnet. You can see the "before" version on the left. I cut the brim off in the back of the hat and then wired the edge and covered it with petersham ribbon so that I could curve it around my face. 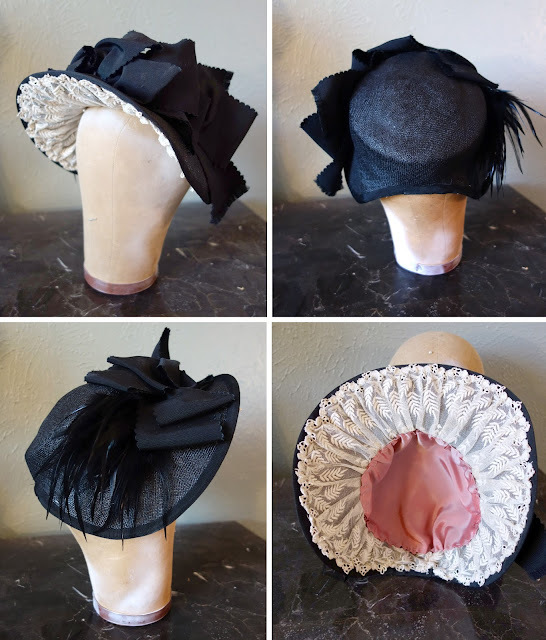 Then I stitched some wide vintage lace into the inside of the brim, and I trimmed the outside with some vintege ribbon and the original black feathers from the hat. The ivory silk bow that was around the hat when I bought it was repurposed for the bow at the neck of my dress. I love the long, loosely curled ponytails that you sometimes see in the late 1870's, so I took the easy way out of styling my hair and just attached a clip-in hairpiece and tied it with a bow. I think it's a nice change of pace from the more severe buns of the 1880s. I only got a few posed pictures of my dress at Costume College, but I'm hoping to get some more fun ones in a pretty setting when I wear it again this winter. But if you'd like to see a few more, you can check out my Flickr album. This is such a sweet outfit Jen. Every detail makes it look as if you stepped out of the prairie and into the present. Well done! 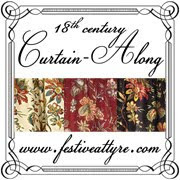 Simple, elegant, and convincingly period all at once! It was really lovely. The trim and fabric all complimented each other so well and I loved the hat. You looked beautiful and serene in it. So many lovely details! You look beautiful. Beautiful outfit! I Always loved the clothing descriptions in Wilder's books! Omg, all three of you look so lovely. If the photo was not in colour I would think it is some really old original picture.